MY SON . . . WE MUST CELEBRATE AND REJOICE, BECAUSE YOUR BROTHER WAS DEAD AND HAS COME TO LIFE AGAIN. This Sunday, our Lenten readings remind us of God's extravagant love throughout salvation history. Our readings are about reconciliation - us to God and us to each other. In our first reading (Joshua 5:9-12), the Israelites are spending their first day in the promised land, at Gilgal. Their weary years in the desert, eating manna, are behind them. It is now Passover in the promised land. God has removed the reproach of Egypt; now they eat of the land of Canaan. In our Epistle reading (2 Corinthians 5:17-21), St. Paul teaches us that we are a new creation as God reconciles us to himself in Christ. Similar to the Israelites celebrating their first Passover in the promised land, our old selves have passed away and we are a new creation. We are now called to share that blessing with the world. 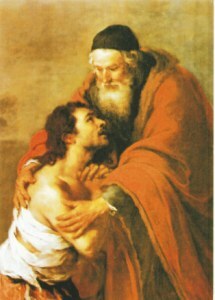 Our Gospel reading (Luke 15:1-3, 11-32) is the parable of the Prodigal Son. The word "prodigal" means "having or giving something on a lavish scale" or "spending resources freely, wastefully extravagant." In this sense, it could be the parable of the Prodigal Father, over-the-top extravagant in his love. Or it could be the parable of the Two Brothers - one craving forgiveness and the other unable to give it. So the father divided the property between them. After a few days, the younger son collected all his belongings and set off to a distant country where he squandered his inheritance on a life of dissipation. When he had freely spent everything, a severe famine struck that country, and he found himself in dire need. So he hired himself out to one of the local citizens who sent him to his farm to tend the swine. And he longed to eat his fill of the pods on which the swine fed, but nobody gave him any. Coming to his senses he thought, ‘How many of my father’s hired workers have more than enough food to eat, but here am I, dying from hunger. I shall get up and go to my father and I shall say to him, “Father, I have sinned against heaven and against you. I no longer deserve to be called your son; treat me as you would treat one of your hired workers.”’ So he got up and went back to his father. While he was still a long way off, his father caught sight of him, and was filled with compassion. He ran to his son, embraced him and kissed him. His son said to him, ‘Father, I have sinned against heaven and against you; I no longer deserve to be called your son.’ But his father ordered his servants, ‘Quickly bring the finest robe and put it on him; put a ring on his finger and sandals on his feet. Take the fattened calf and slaughter it. Then let us celebrate with a feast, because this son of mine was dead, and has come to life again; he was lost, and has been found.’ Then the celebration began. Which of the three characters in the parable can we identify with? Certainly, we can all identify with the repentant son - we've all been there at one time or another. But can we ever identify with the older brother, unforgiving of his father and his brother? Perhaps sometimes we can. Or can we ever identify with the extravagant loving father? Perhaps sometimes we can, or at least we should desire to. Perhaps, at times, we are all three. Lent is a time for reflection.